This is not a crack-of-dawn kind of city (the McDonalds on downtown’s Park Street proclaims itself to be “open early” at 8:00 a.m.). It shuffles awake at about 7:00, when traffic is still quiet; most shops won’t open until 10:00. Breakfast is usually something simple: A shot of the milky, sweet coffee that gives no discernable jolt of caffeine, and a biscuit or cake slice of the sort that fills jars in tea stalls all over the city. It might also be a sweet little folded pancake filled with squash, or toast with an omelet, perhaps while reading one of the dozen or so Bengali, Hindi, and English-language newspapers that circulate in the state. Meanwhile, lunch preparations are underway. They’re most varied and elaborate in the central business district, where office workers who don’t bring a tiffin box from home need feeding. Young boys get to work peeling potatoes, mixing dough, chopping vegetables, boiling eggs, breaking coals for semi-permanent cylindrical stoves. At this point, you’ll see rows of neatly folded samosas ready for the frying pan, which has already been turning out puffed parathas for scooping up the various stews under preparation. Walking through the most popular food thoroughfares starts to smell amazing; this is one of India’s spice capitals, and even the most pedestrian cuisines use it liberally. Around noon, dining is in full swing. I’m no omnivore, so you’ll have to rely on others for gastronomical accounts. But here’s the gist of what’s on offer: Kati rolls stuffed with kebabs, chapatis and dal, rice with fish curry, potato mush called chat, vermicelli noodles flash fried with finely chopped carrots and cabbage, savory doughnuts called vada, dosas rolled with chopped onions and tomatoes, grilled sandwiches with both meaty and veg fillings, deep fried eggplant slices, steamed lentil cakes called idli served with chutney, cheesy puff pastries, a spicily dressed salad of sprouted garbanzos and chopped veggies…and that’s only what I could identify. Lunch slackens off around 2:00 p.m., and the chefs turn to washing cauldrons, pans, and dishes (substantial meals are usually served on aluminum plates, while snacks come on banana leaves that have been pressed and dried into a bowl shape. I only saw Styrofoam a couple times, which is good, because it all gets thrown on the ground). But the city’s hungry masses still need something to tide them over until dinner. In the afternoon, fruit sellers chop and elegantly arrange little plates full of bananas, papaya, watermelon, and pineapple for eating with a toothpick. 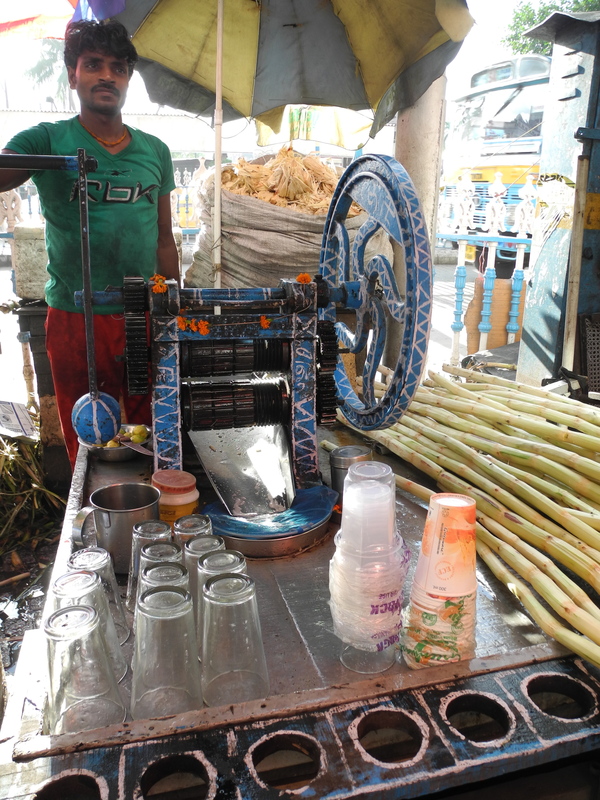 You might slurp a lassi—creamy yoghurt mixed with sugar and ice. And everywhere, everywhere, are these sweet shops selling confections of butter and sugar rolled into balls or pressed into squares, sometimes decorated with some sort of edible metallic leaf. Staying slim under such circumstances, unless one is among the wiry laboring class, must be a challenge. Dinner proceeds in a pattern similar to lunch, although lighter this time, since more workers are picking up bags of fish or veggies for family dinner at home. This month, however, has been slightly different: It’s Ramadan, when a significant percentage of the population hasn’t eaten or drunk anything all day. The tension mounts as the sky darkens, when you’ll see plates of fruit being prepared to break the fast. Around 6:30, the wail goes up from mosques around the city, often emanating from multiple directions, and those who’ve been waiting for it takes gulps of water and dig into communal plates of whatever they have available. 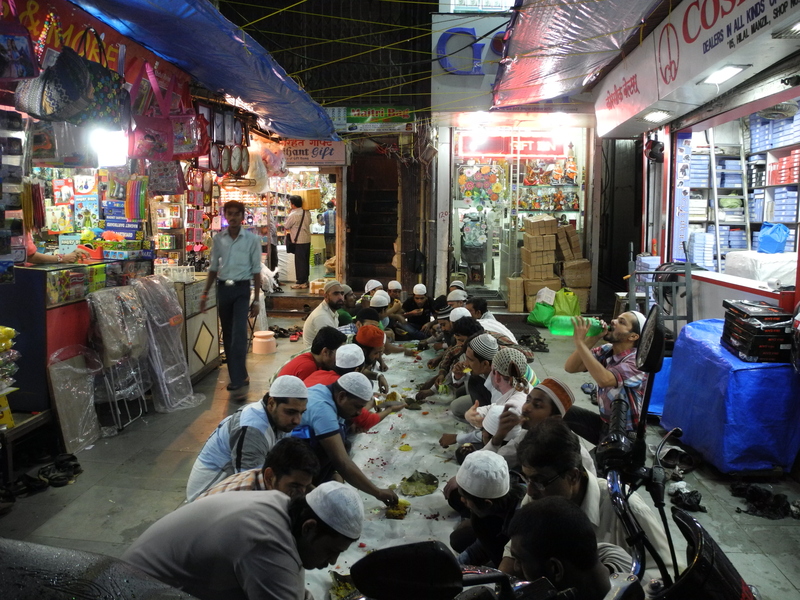 Commerce pauses for about 20 minutes, as Muslim merchants and restaurant owners sit on the floor to eat dinner with their staff. New Market is bedlam, as gaggles of women bring all their kids to food stalls that dish out bowl after bowl of stew. After that, the day’s frenzy eases a little. Streets start to darken—pub culture exists, but mostly without public rowdiness. Food stalls are battened down with tarps, and bed rolls come out, until the whole thing starts over again a few hours later. The evening meal. (Okay, this is in Mumbai, where the pattern is largely similar).